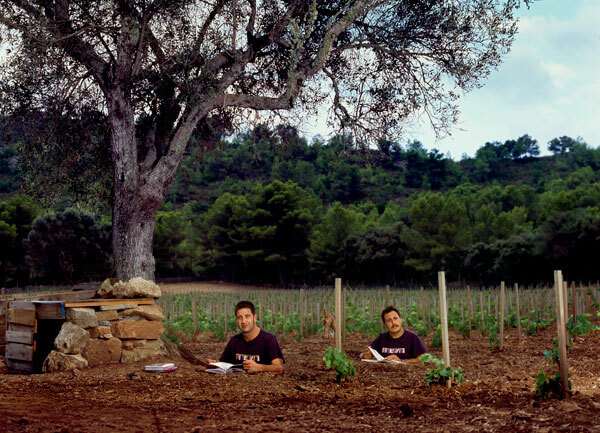 In August of 2006, Francesc Grimalt and Sergio Caballero set up 4Kilos Wines in Mallorca, a company dedicated to producing wines that reflect the strength of the grape and its nuances but with a different approach and different presentation. Francesc Grimalt, winemaker and former partner and technician of the Anima Negra Cellar in Mallorca, is known mainly for rescuing the variety of the native grape Callet on the Balearic wine scene. Sergio Caballero is musician and founding partner and co-director of the Sonar festival of advanced music and multi media arts, and who is responsible for its image. In late September of 2006 in the garage of a fellow winegrower and with few resources but with excellent grapes, 4kilos produced its first wine.The fermentation and maceration of the wine was undertaken in milk refrigeration units, which thanks to their form create a large, surface area of skin pulp. The remaining 50% is produced in open barrels of 225. The wine was raised for fourteen months and was launched onto the market in May 2008. In 2007 alongside Apolonia Viticultors -Balearic Agrarian society- they converted a former sheep farm into a small winery. There they were able to produce the crop for 4Kilos 2007 and their new project 12Volts 2007 that after twelve months in the barrel will be launched onto the market at the beginning of 2009. Their concept is not only that of variety but of the importance of the combination of strain-soil-climate-growth. From the offset they have been supported by winegrowers, very important when attempting to make rational viticulture and respect the environment. In many vineyards native vegetation cover is used in order to obtain more concentrated grapes, better ground porosity and increased microbial population. The vineyards are located in different parts of the north and south of Mallorca, the reason for which being that they do not belong to any particular D.O. The strains are planted mostly in soils Cal Vermell a popular name to describe the Franco clay soil. The varieties that are grown are Callet, Cabernet, Sauvignon, French Fogoneu, Merlot, Monastrell and Shyra. The name 4Kilos comes from the initial investment in the anterior currency of pesetas by both partners, which is to say, 4 million pesetas. A modest investment for this sector which demonstrates that a good wine does not depend on a great economic effort but an ambition for quality and a passion for the product. 4Kilos is unmistakable in its signature and a declaration of principles.